Earlier this year, it appeared as though "High Stakes Poker" was dead and buried. GSN halted production of the show and decided not to pick up the next season of the World Poker Tour. Gabe Kaplan and A.J. Benza weren't told what was happening with the show. It appeared that "High Stakes Poker" might be finished, despite the high ratings that the show received year after year. A few months ago, there was some good news for poker fans. 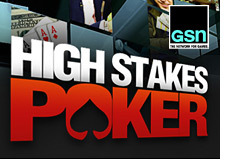 GSN confirmed that the fifth season of "High Stakes Poker" would in fact take place. The show wasn't dead after all. "High Stakes Poker", considered by most to be the best poker show on television, was coming back. We still don't know exactly who will be participating in the fifth season. You can bet that invitations will be extended to players such as Daniel Negreanu, Phil Ivey and Doyle Brunson.Mori Eskandani, executive producer of the show, said that fans will be "in for a thrill" when they hear about who is playing. 1. The fifth season of the show will be taped between December 19th and December 21st. 2. The minimum buy-in for this season will be $200,000. 3. The game will be taped at the Golden Nugget Hotel and Casino in Las Vegas. That's all we know for sure so far. Once the taping of the show concludes on December 21st, we should get a better idea of who is participating - I'm sure that multiple pros will post about the taping on their blogs. The airing date of the first episode is unconfirmed as of right now - I've heard mid February. We'll post more details when we get them.